I was originally going to make a salted chocolate & cherry cookie this week, similar to one Matt had at Common Roots last week. But it seemed a little to much like the salted chocolate covered caramel cookies so, those will wait for another time. Then, Matt came up with the idea for this biscotti. I think you could call this cookie a fusion of cuisines. Biscotti is Italian but the addition of chipotle & cinnamon is definitely Mexican influenced. Then to top it off I added some southern pecans. Though these maybe a mix of cultures, they certainly all went together well for a tasty cookie. 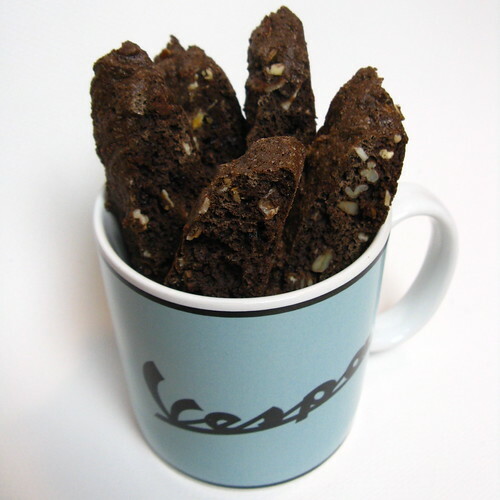 This is a very crunchy biscotti, perfect for dipping in coffee or hot chocolate. The heat from the chipotle is a surprising back of the throat heat that just warms you up a little. In a small bowl beat the eggs & vanilla together. In a large bowl stir the flour sugar, cocoa, espresso, baking soda, chipotle & cinnamon together. Add the egg mixture in & stir until well mixed. (I found using my hands was the best way to do this.) Mix in the nuts & chocolate chips. The dough will be very dense & sticky. Split the dough in two and form into logs about 12" long by 1 1/2" wide on a prepared baking sheet (either greased & floured or covered with parchment or a silicon pad). Bake for 50 minutes. Carefully remove the logs to a rack & let cool for 5 minutes. Turn oven heat down to 275 F. Using a serrated knife cut the logs into 1/2" slices on a 45 degree angle. Put the slices back on the baking sheet with one cut side down. Bake for 10 minutes then flip to the other cut side & bake for 10 more minutes. Cool on a rack. I love a little spice in my cookies! Especially when it's subtle like that. The photo looks so inviting--I want to grab my coffee and dig in! I love the addition of chili in my chocolate. One of my favorite things to do is add it to hot cocoa with a little cin. I bet that would taste GRAND wit the delicious cookies! Wow- I just know I would lvoe these. Great idea Kat. I adore the kick from the spices in this biscotti recipe. This would go so well with a hot cup of coffee. They look wonderful! A question on the cup, though--where did you get it? The logo and colors look like the one for Vespa restaurant in Chapel Hill, NC. Just wondering if there's more than one Vespa--because I always thought there was just the one! Cassie - It is the logo for the Vespa scooters from Italy. My husband got the mug for me at a local gift shop. What a great idea! And you know I love biscotti. I don't have any chipotle powder in the house yet, but I've got to get some so I can give it a try.